Americana Auction Live and Online-only | American antiques | Skinner Inc.
More than 650 lots to be offered live on August 11th; an additional 300 lots to be offered online from August 5th to 13th. MARLBOROUGH, Mass – July 30, 2013 – Skinner, Inc. will host an auction of American Furniture and Decorative Arts on August 11th at its Marlborough gallery. Skinner’s “August Americana” sale continues to be a highlight of the summer auction calendar, and this year Skinner is pleased to introduce a 9-day, online-only component to this annual event. From August 5th through August 13th Americana buyers can compete for more than 300 lots offered exclusively online. The collection of well-known furniture scholar John T. Kirk will be offered and features country furniture, ceramics, and decorative arts. 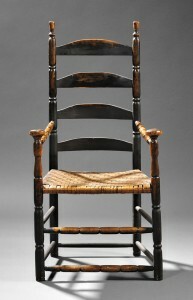 The first lot in the collection, a black-painted ladder-back armchair with sausage-turning and mushroom handholds (lot 200, $1,000 to $1,500), demonstrates Kirk’s discerning eye for unique chairs. Other highlights include an architectural finial from the Meeting House Hill area in Dorchester, Massachusetts (lot 244, $300 to $400) and a blue-painted desk, of unusual proportions, constructed for and used in the Chester, New Hampshire post office (lot 245, $400 to $600). These pieces, in particular, are cited in Kirk’s book, The Impecunious Collector’s Guide to American Antiques. Kirk collected and appreciated pieces as much for their evidence of use and related aesthetic changes, as for the pieces themselves. Instead of overlooking well-used items, he understood the particular evolution of beauty that results from wear and repair over time. His idea that such evidence of use added to the individual appeal and interest of the piece was, and still is, cutting-edge. Read his essay, “I Bought it ‘Ratty’ and Left It Alone” on the Skinner Antiques & Fine Art Blog. The cover lot is a particularly subtle work by Ammi Phillips depicting a self-assured young man with painterly shock of ginger hair, confidently addressing the viewer (lot 90, $15,000 to $25,000). A rare and arresting portrait by the highly-collected Chinese artist Spoilum portrays a member of the British East India Company. 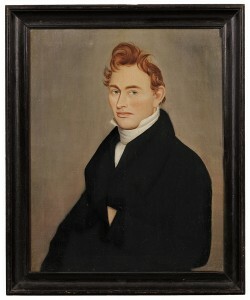 The subject, a man with striking white hair, wears a blue uniform jacket adorned with the gilt braiding and buttons known to have been worn by members of the organization (lot 471, $15,000 to $25,000). A pair of portraits of Mr. and Mrs. Kimball Dustin by Thomas Ware of Vermont will also be offered (lot 91, $6,000 to $8,000). The auction presents an excellent selection of country and painted furniture, including a Chippendale carved birch slant-lid desk from Newburyport, Massachusetts (lot 285, $3,000 to $5,000). From a New Hampshire collection comes a particularly fine blue-green painted cupboard with concave open shelves above a paneled cupboard door (Lot 74, $15,000 to 18,000). A paint-decorated tall clock from Winchester, Connecticut, features a rare painted eagle decoration on the base (lot 177, $15,000 to $25,000). Notable pieces of formal furniture include a very rare walnut and walnut veneer escritoire made in Philadelphia around 1710 (lot 38, $30,000 to $50,000). Behind an elegantly veneered fall front is a complex interior of compartments and drawers, many of which can be removed to reveal additional secret drawers and compartments. 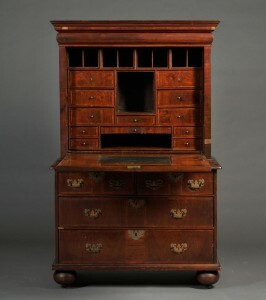 Identified as late seventeenth/early eighteenth century Philadelphia in origin by early twentieth century scholar and collector Eugene Bolles, this desk relates to a labeled example found in the Colonial Williamsburg collection. A Chippendale mahogany tilt-top tea table with scallop-shell carved knees from coastal Massachusetts (lot 279, $4,000 to $6,000) and a labeled Federal inlaid mahogany lolling chair by Joseph Short (lot 301, $10,000 to $15,000) round out an diverse selection of formal furniture. A group of clocks from the Old Sturbridge Village, J. Cheney Wells collection will be presented. Wells was a founder of OSV, and proceeds from the sale of the six clocks will be used to update its collection of nearly 60,000 historic objects. Highlights include a Simon Willard Federal mahogany inlaid tall case clock with rocking ship dial, c. 1785 (lot 317, $3,000 to $5,000) and a Simon Willard Federal mahogany inlaid patent timepiece, c. 1810 (Lot 315, $2,500-3,500). Outstanding examples of 18th century needlework come from a Wayland, Massachusetts antiquarian and include a crewelwork decorated pillow in extraordinary condition (lot 23, $1,500 to $2,500), as well as an eighteenth century zigzag pattern canvaswork pocketbook that once belonged to Joseph Winslow (lot 24, $4,000 to $6,000). It retains its brilliant colors and an engraved silver clasp. A group of mochaware from a private estate features a variety of forms including an early 19th-century barrel-form pitcher (lot 414, $500 to $700) and a silver-mounted mustard pot (lot 420, $300 to $500). A number of Nantucket baskets, ship portraits & dioramas, boat models, and scrimshaw-decorated items will also be sold. In a newer expression of Americana, the auction will begin with the presentation of a 1941 Ford V-8 Super Deluxe five-passenger Coupe (lot 1, $20,000 to $25,000). 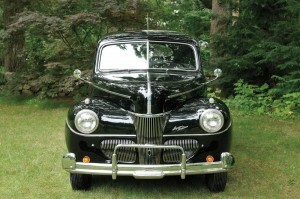 This black pre-WWII coupe sports sleek curves and a two-tone interior in black and gray. On August 5th bidding will begin in Skinner’s first Americana – Online auction, which will offer more than 300 lots of American antiques including folk art, textiles, Chinese export porcelain, early glass, rugs and carpets, historical prints, and country furniture, as well as marine and nautical antiques. Highlights include Currier & Ives lithograph titled The American Fireman, Rushing to the Conflict (lot 954, $800-1,200), a very large selection of Canton and Fitzhugh table ware, and a cased wooden model of the Frigate U.S.S. Constitution, “Old Ironsides” (lot 912, $1,000 to $1,500). Previews for both auctions will be held on Thursday, August 8, 2013, 12 p.m.-5 p.m., and Friday, August 9, 2013, 12 p.m.-8 p.m., and Saturday, August 10, 2013, 12 p.m.-5 p.m.
An illustrated catalog for #2669M and 2667T is available by mail from the subscription department at 508-970-3240. It is also available at the gallery. The Skinner website allows users to view all lots in the auctions, leave bids, order catalogs, and bid live in real-time through SkinnerLive!. Visit and “like” Skinner on Facebook at http://www.facebook.com/skinnerauctions. Skinner auctions draw international interest from buyers and consignors alike, with material regularly achieving record prices. The company’s auction and appraisal services focus on fine art, jewelry, furniture, and decorative arts from around the globe, as well as wine, fine musical instruments, rare books, clocks, Judaica, and more. Monthly Skinner Discovery auctions feature a breadth of estate material. Widely regarded as one of the most trusted names in the business, Skinner appraisers have appeared on the PBS-TV series, Antiques Roadshow, since the show’s inception. Skinner has galleries in Boston and Marlborough, Massachusetts with an international audience of bidders participating in person, by phone, and online through the SkinnerLive! online bidding platform. For more information and to read our blog, visit the website at www.skinnerinc.com, find us on Facebook at https://www.facebook.com/skinnerauctions, or follow us on Twitter @Skinnerinc. This entry was posted in News and tagged american antiques, American furniture, american painting, american textiles, Americana, Ammi Philllips, antiques, banjo clock, Chinese export, chippendale, chris barber, decorative arts, federal furniture, folk art, Ford V-8, historical prints, John Kirk, marine art, massachusetts, mochaware, nautical antiques, porcelain, portrait, scrimshaw, Simon Willard, Stephen Fletcher, tall clock, whaling by Skinner. Bookmark the permalink.